Quebec-based playwright, screenwriter and director Michael Mackenzie is less known in Canada than abroad where some of his plays have had four- and five-year runs. In 2011 his play Instructions to Any Future Socialist Government Wishing to Abolish Christmas was at hit when it premiered at the Centaur Theatre in Montreal and was a hit again when it played translated into French. Luckily for us the Coal Mine Theatre is staging the play’s belated Toronto premiere. It’s a thrilling mixture of economics, Greek tragedy and satire that finishes with a dramatic punch that will leave you reeling. Like the authors of Greek tragedy, Mackenzie observes the three unities of time, place and action. All the action occurs in a single location, a downtown executive’s office, and its 80 minutes elapse in uninterrupted real time. The action consists entirely of a young woman’s unexpected visit to her employer and his attempt to discover why she has come. The location is one of the business towers in downtown Toronto and the time is 4am on Monday, September 14, 2008. On Sunday, Lehman Brothers, a global financial services firm, had filed for bankruptcy after the Federal Reserve Bank would not lend it financial support. This was the start of the global financial crisis of 2008 and Jason (Ted Dykstra), a pension fund manager, is staying up to see how the London stock market will react. Into his office steps former employee Cass (Diana Bentley), who had been put on a paid leave following an event known only as “the incident” after which she was hospitalized. Jason refers to Cass as an “idiot savant”, the now-outdated term for someone who has savant syndrome. In Cass’s case, she is autistic and has other neurological issues, but she has mathematical abilities far beyond what is considered normal. She can do complex calculations in her head and has an amazing memory for numbers, dates and times. It was for this reason that Jason hired her and trained her to apply her skills to financial data. Cass brings Jason a report on the pension fund that he created that another employee was too sick to deliver. Although Cass has come for another reason, not revealed until the end, Jason has her look at the report to give her opinion. Cass notes that the pension fund has an ethical investment clause and that Jason has nevertheless invested heavily in coltan mines in the Democratic Republic of Congo that are known to recruit and train child soldiers. When holders of the pension find this out – and they have apparently already discovered this – they will want to withdraw their money. They will not have to heed the 90-day lock-up period and Jason’s firm does not have enough capital to reimburse them. Thus, disaster awaits Jason in particular just as it awaits the financial world in general. As a reward for Cass’s truth-telling, Jason threatens to fire her. The play, however, is not primarily about finance. As part of Cass’s therapy she has been learning not to take all the words people use literally. She has been learning when to recognize when a word or phrase is used as a metaphor or as irony or as a joke. As it turns out, Jason’s behaviour in the financial world parallels his behaviour in his personal life. He had hoped to become a classics professor but when that did not work out he turned to finance to make a better income. He especially likes the ancient Greek historians because in he believes they support his social Darwinist world view. His favourite quotation comes from Thucydides (c.460-400bc) that, “The strong do what they can and the weak suffer what they must”. The hypocrisy of his view is clear when he supposes the the government will not allow financial institutions to fail, i.e. will provide corporate welfare. His cynicism is evident in his view that “Money is the nothing that we believe in”. Cass, for whom numbers are more real than people, comes to finance from a completely neutral position. She lives with her mother, an avowed communist, who shuts herself up every Christmas to work on the pamphlet that gives the play its unusually long title. Her mother’s view is that in a capitalist society people need an outlet to make themselves feel benevolent and Christmas gift-giving provides that outlet. Her hope is that under a socialist government social benevolence would be so widespread that Christmas will no longer be necessary. Cass’s mother also enjoys ancient Greek literature, though she prefers the tragedies to the histories. Thucydides may depict the triumph of the strong over the weak, but the tragic playwrights depict the downfall of the strong because of their hubris or overweening pride. Because of this, a debate develops in the play between “my Greeks “ and “your Greeks”, meaning the historians versus the tragic playwrights. With references to ancient Greek literature underpinning the discussion of finance, Instructions is a very rich play. Mackenzie has given his characters names with mythic resonance to suit their roles. We associate Jason, of course, with his quest for the Golden Fleece, and it may be a joke that the Jason of the play is pulling a golden fleece of a different sort on his investors. To steal the Golden Fleece, Jason needed the help of Medea, but when he began to have political ambitions, he threw her over for Creusa, daughter of King Creon of Corinth. Cass, we assume, is short for Cassandra, the Trojan princess in Homer’s Illiad who was cursed with the ability to foretell the future but not to be believed. Since Cass is only now learning about metaphor and irony, she has grown up with a literalism that has made it impossible for her to lie. Mackenzie’s Jason thus disbelieves Cass only at his peril. Ted Dykstra, who created the role of Jason in 2011, is as superficially arrogant and self-obsessed as we would imagine the sleazier fund managers to be. He is fuelled by anger as shown in his bouts with the punching bag in his office. Yet Dykstra shows that beneath this outward bravado and easy cynicism lies an unacknowledged fear that everything could go wrong in a moment. Diana Bentley gives an extraordinary performance as Cass. Gradually, beneath Cass’s physical tics and verbal habits of repetition, Bentley reveals the strength of Cass’s personality, one that is much more resilient than Jason’s. Bentley portrays Cass like the wise fools in Shakespeare whom we laugh with, not at. In an especially disturbing moment, Cass shows how she learned to be alluring by imitating a woman’s actions in a shampoo commercial on a point by point basis. The effect is not only uncannily accurate but extremely eerie while at the same time it points out the relation between sexual provocation and the provocation to spend money. Bentley makes this physically and verbally difficult role look completely natural and wins our sympathy, not because of Cass’s disabilities, but because of her character’s unswerving determination. The action takes place on Steve Lucas’s appropriately Spartan set highlighted by a well-chosen painted triptych depicting two frightened children in front of a collapsed barn. David Storch has fluidly directed the work and carefully increases the tension between the two characters until the devastating finale. Since Mackenzie gives us a character with savant syndrome and another who is a pension fund manager, their discussion naturally is filled with references to mathematical models and financial jargon. If you are familiar with either of these types of terminology, you will see how well Mackenzie explains how the financial collapse of 2008 came about. If you are not, don’t be put off. It is more useful to understand the metaphorical nature of the play than to understand, say, a Gaussian copula. When one of these terms really is important to the play, like “asymmetric information” (when one person in a negotiation knows more than the other) Mackenzie will explain it. Instructions is one of the most intellectually and emotionally powerful Canadian plays to come along in the last several years. We owe a debt of gratitude to the Coal Mine Theatre for staging the Toronto premiere, and you owe it to yourself to see it. 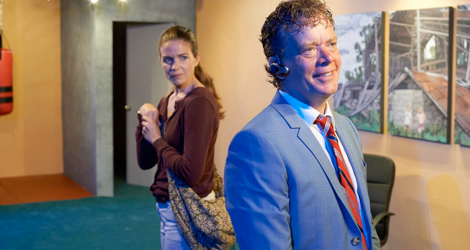 Photo: (from top) Diana Bentley as Cass and Ted Dykstra as Jason; Diana Bentley as Cass and Ted Dykstra as Jason. ©2016 Michael Cooper.